Slow changes in the birding at Rainham RSPB late February to mid March. The weather remaining dull, windy with rain in the air on several visits, but one weekend offered a glimmer of Spring. Gull numbers dropped during the period did the wintering ducks. Marsh Harriers put on a nice show with at least 4 different birds present on any visit. Peregrines continued and the local Buzzards took to the skies. Cetti's Warblers became very noisy and Chiffchaff's more obvious. Noteworthy was a single flock of 110 Fieldfare on Rainham 'West' with 33 more flying east early morning on a cold Saturday 28 February. Spring was around the corner as a Sand Martin flew over the same site on a 'balmy' Sunday 08 March. Small Tortoiseshell and Red Admiral butterflies were in flight the first weekend in March. Oystercatchers came in during this period with at least 3 pairs along the Thames during the March WeBS count. More sign of Spring with the reserve's first 'Lurp' (Little Ringed Plover) of the year occurring over the weekend of 14/15 March. A Raven 'cronked' its way onto the reserve in the morning of 15 March and a smart looking 'Scandinavian' Rock Pipit was seen all too briefly from the Butts hide. Would have loved to have got a photo of this bird. Last month saw 'double yolkers' cooked on the stove for breakfast, this month has seen 'Rasher-gate'. 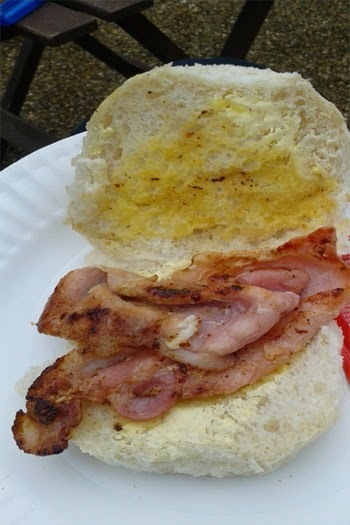 Was I lucky enough to be presented with 2 rashers, or is it just an optical illusion? Beach football in Sheffield on Saturday 14 March. Owls drew 1-1 at home to Fulham. It felt like a loss, given the way Fulham were allowed to equalise... must play to the whistle! The pitch was bare, very bare! En route saw 5 Red Kites over the A1 near Peterborough and half a dozen or so Kestrels throughout the journey.